1. Mix together the sugar and salt then, in a large bowl, thoroughly rub all over the pork. Leave the meat to stand at room temperature to cure for 2 hours. 2. Preheat the oven to 150˚C, gas mark 2. Wash the salt/sugar mixture off the pork and dry the meat with kitchen paper. Score the skin and liberally sprinkle it with salt. Put the pork in a roasting tin and pour in the stock. Roast for 2 hours 30 minutes. 3. 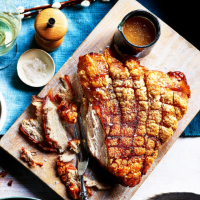 Carefully pour the stock and juices from the tin into a saucepan; increase the oven temperature to 220˚C, gas mark 7, then return the pork to the oven for 20 minutes to crisp up the crackling. Transfer the meat to a board and leave to rest, loosely covered, for 20 minutes. Meanwhile, simmer the stock for 5-6 minutes until reduced a little; skim off any excess fat. Season and serve alongside the pork.